Homemade ice cream became hugely popular in 1880s America, and the trend crossed the Atlantic soon after. 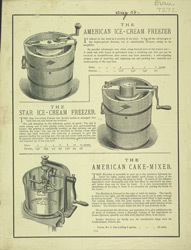 Designs for these American-style ice cream makers varied little from model to model, based on the principle of having a small metal bucket inside a larger, wooden staved bucket. The gap between these buckets was filled by a freezing mixture of ice and salt. Cream was then poured into the metal bucket and churned with an external paddle. In the 1880s it became very fashionable in America to make home made ice cream, this trend soon crossed the Atlantic and American ice cream making machines were popular in Britain. Generally the designs for the machines were very similar; a small metal buckets inside a larger wooden staved bucket. The metal buckets were surrounded by a freezing mixture of ice and salt and were fitted with a paddle that was worked by an external handle. Cream was poured into the inner bucket and was then mixed with the paddle.